Tuesday morning I caught a very early train and returned to my husband's hometown near Warwick and Stratford-Upon-Avon. There was still one more place to go on my Homage to Orwell. 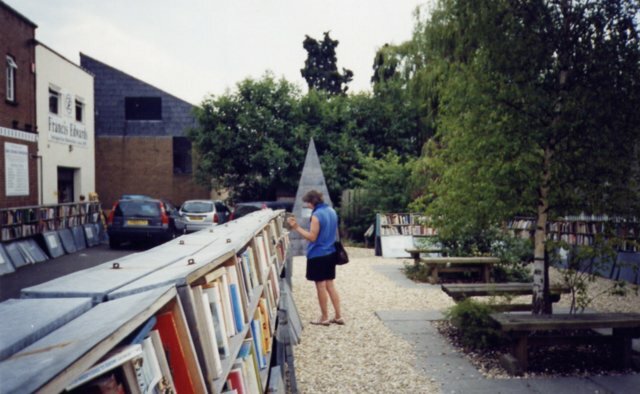 A couple of months previously my husband was reading the travel section of the newspaper and came across an article about a town in Wales that had more used book stores than anywhere else on the planet. 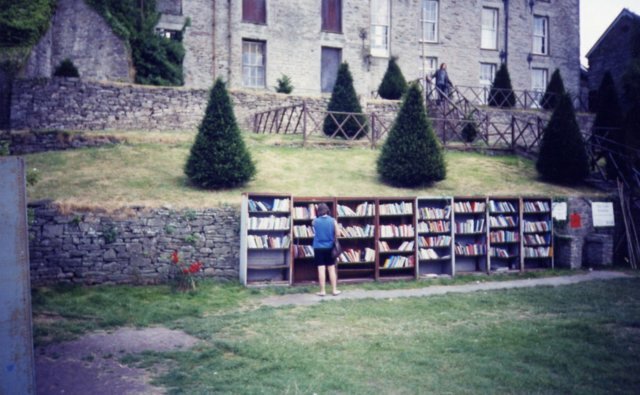 It included a photo of outdoor bookshelves absolutely brimming with used books. This was definitely a place we (well, make that "I") wanted to go to. But actually, my husband is the one who usually finds me all my books and so it was going to be fun for him as well. We cut out the article and brought it with us to England to show and amaze people with, as most people didn't seem to know that such a place exists. Our plan was to rent a car for the day and drive to Hay-on-Wye, in Wales, which was the name of the aforementioned town. Early Wednesday morning the two of us set out on the journey to Wales after breakfast and filling up for "petrol" in Warwick. Then we got onto the motorway heading southwesterly toward Hereford where we would be getting off the motorway and continuing by country roads to Hay-on-Wye. I had never been to Wales before - in all the times I'd been to England - and I don't think my husband had either. I was glad to get past the signs leading to Hereford because every time I saw them the music from My Fair Lady would pop into my head and I'd remember the phrase, "in hartford, hereford and hampshire, hurricanes hardly ever happen". I was starting to feel like Winston who couldn't get the rhyme "oranges and lemons say the bells of St Clement's, you owe me three farthings say the bells of St Martin's" out of his head. 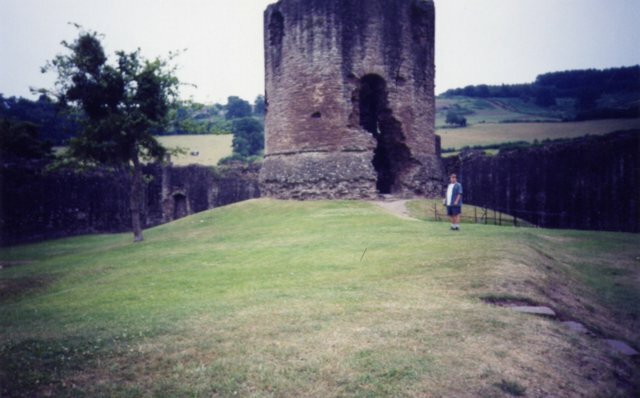 In the above photo my husband is standing in front of the massive tower of an ancient fort. The photo doesn't do it justice. It had been looming ahead of us in the distance for miles. An almost equally ancient church is next door. Note the rolling hills in the background. I'd never seen physical geography like this before. Continuing on our way we drove through pastoral countryside so picture-postcard perfect that the words "golden country" popped into my mind and I started wondering if THIS was the area Orwell had in mind for Winston's memories of "the golden country" and not, as I'd previously thought, Henley-on-Thames. Or maybe it was a combination of them both. As a boy Eric Blair used to accompany Jacintha and Prosper Buddicom to their Aunt Lillian's home, named Ticklerton, in Shropshire near Wales. In a way this land is like paradise on earth to look at. Up to the left of us there were rolling hills with sheep grazing contentedly on them. To the right of us the landscape dropped lower and then raised up again into distant hills where once again sheep were contentedly munching. The country roads were completely hedged in and we wondered how we'd get by if we ever met a car coming in our direction. Amazingly, the whole way there I don't think we did. Eventually, after an irresistable detour following a sign to "Arthur's Stone", we pulled into Hay-on-Wye, the town of books. 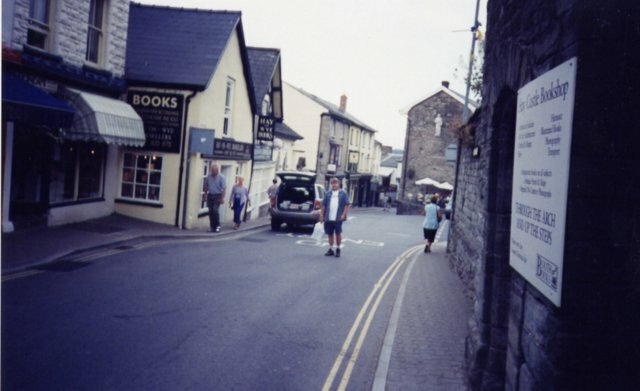 The first photo above shows my husband standing on a bookshop-lined street in the centre of Hay. In the forefront you can see an ancient brick wall with an arch doorway. Going through that doorway a person emerges into the grounds below a castle. Bookshelves line the walls all round and you pay on the honour system - fifty pence for hard-covers. That's me browsing in the photo on the right and happily we made a couple of deposits into the pence depository box. One of the books I bought cost fifty pounds, or one hundred and twenty-five Canadian dollars. That may amaze some people, but if they really stop and think about it they'd realize that it's not an extravagance at all. People pay more than that for a good pair of shoes, or a half-decent dress or pair of pants, or a night out on the town or a video game or whatever their interest happens to be. Booklovers buy books. Actually, Orwell wrote an essay about it, entitled Books Vs Cigarettes. The last bookstore we browsed before leaving Hay was located in a converted cinema. Inside there are 200,000 used books and a couple of great books jumped off the shelf at us there. The photo above shows me perusing the Cinema Bookshop's outdoor selection. But looking at the photo more closely, I see much more than that. I see the battle of good over evil. I see the image of Saint George slaying the Dragon. Now that you've done the reading, do you see the symbolic images in the photo? the only major remedy remaining is education. for the individual human being." We left Hay by a different route from the one we came in on. This one took us down a steep hill and across a bridge over the river Wye, from which, of course, Hay got its name. I kept my eyes open for as long as I could, trying to absorb the beauty while it lasted. But gravity finally got the better of my eye-lids and I drifted in and out of sleep, thanking God again for my Homage to Orwell.